Remember the ugly old television? Now, it's a lovely dog bed (I told you so!). And a dog who has been humbled by his judgmental nature. It really looks a whole lot better in person. It turned out nicely and it adds some nice color to our white-wall plague. 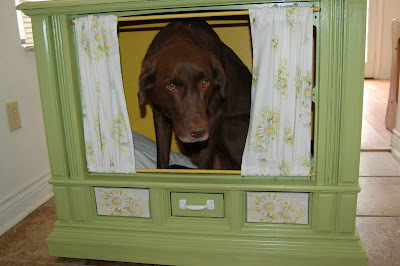 Tucker seems to be more impressed with it than the dogs, however, so maybe it will eventually be used as a puppet show stage. I would have never EVER thought of using it as a dog bed! It turned out adorable! You are so creative!!! I miss you so bad. That is so awesome! You are very creative! that is an awesome idea! and it looks fantastic. Amazing job! Awesome! I saw your comment on Craftnest and had to see what you did! Looks like it is a great small boy house, too! Excellent idea! Maybe I'll try my had at it for our ginormous cat! Thanks for the post! Brilliant!!!! SO cute. Saw on design sponge. 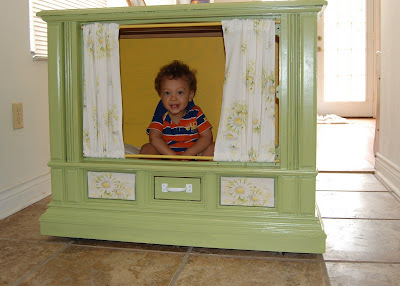 I think this would be super cute to do puppet shows with. How did you remove the TV? Thanks! Thanks for all the nice comments, ladies! Autumn: Great question! I'll post some pictures and give a brief description. It looks fantastic! I'd love to know how you did this as well. I have an similar old TV that I was planning to get rid of-but just might keep it now. My dog needs a new bed! I want to do this! But I'm having the hardest darn time finding an old tv like this. Any suggestions? 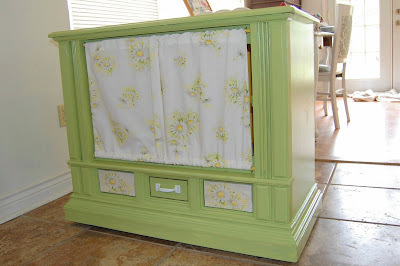 I'm using 'vintage tv console' in craigslist searches. I would start scouting thrift stores, garage sales, pawn shops, and yes, craigslist! As soon as you put it at the back of your mind, you will find one! :) Good luck in your search. Let me know when you have found one and how it turns out! I really like your new design dog bad, your dog is looking really very cool in bad. really you are very creative. Ah! I love this! How did you get the TV out? My mother-in-law just took one of these out of her living room and now I am trying so hard to get in touch with her to get it from her! The TV was pretty easy to get out...You will need to unscrew the back of the console and then remove a series of screws. It takes patience and an extra hand, but it's fairly simple. Thanks for asking! How do u get the actual tv out of the casing...?